I make art quilts interpreting the natural beauty I see around me. I also love making quilts honoring the people who inspire me. I’m constantly trying to expand my boundaries, to try new things, to achieve new heights, to make something beautiful. Thanks for allowing me to share my fiber art journey with you. 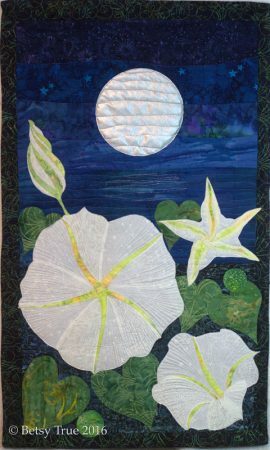 I will be presenting a lecture to the Mount Vernon chapter of Quilter’s Unlimited on October 23rd, at the Hollin Hall Senior Center in Woodlawn, VA! For more information about QU, see www.quiltersunlimited.org. Go to the Mount Vernon QU blog for more information on their activities. Be sure to check my blog often for updates! Copyright © 2019 · All images copyrighted by the artist, Betsy True, and may not be reproduced without permission from the artist.